The photos of Stay Gold and Maruka Candy -- holy, wow. Am I the only one who just realized how much Sunday stamped his foals? They looks amazing...and so much like papa. Ridan_Remembered wrote: Tachyon, thank you so much for continuing to keep us informed about Sunday's descendants. Sunday was such a great favorite of mine. Because he was based in Southern California, I saw him race often. It was heartbreaking when he was sold to Japan, but the Japanese appreciated him and now Sunday has left a remarkable legacy. Sunday Silence was loved by everyone! Japanese racing largely owes what it is now to Sunday Silence. And it's a lot of fun to follow his achievements as a stallion and his offspring worldwide. One may realize that Sunday Silence is still on the way up. 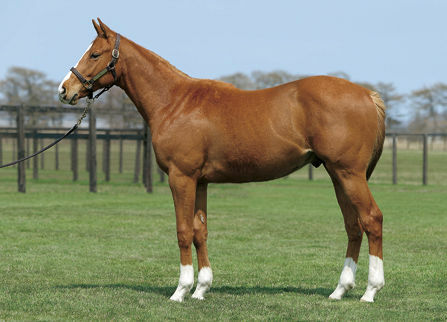 This is Orfevre, the Triple Crown winner 2011 and the greatest grandson of Sunday Silence ever trained. All set for his second career at stud, let's never forget the racehorse. A superstar of the international circuit. A classy and unpredictable monster who lit up the stage for three full seasons, supported by connections who were never afraid to take on the best. He went to France and almost conquered and on his final start he showed his true worth. He was a headcase and a livewire, but what a talent. Ladies and gentlemen, Orfevre. Orfevre is a beautiful horse, and that cat in the one photo is hilariously plump. From what you posted, it seems that Halo's fiery temperament is showing up in his great-grandson. Seems to me most alpha males in any species have some fire in them or they wouldn't be alpha males. Orfevre is a great looking horse. And that cat is pretty funny. TBird wrote: Orfevre is a great looking horse. And that cat is pretty funny. That pick (with that cat) is very popular in Japan, too. Talk about a healing power. Teruya Yoshida (Shadai Farm) and Shigeyuki Okada (Big Red Farm) have visited Oriental Art 2012 colt. He looks just like his brother Orfevre !! tachyon wrote: Teruya Yoshida (Shadai Farm) and Shigeyuki Okada (Big Red Farm) have visited Oriental Art 2012 colt. Lovely colt. I wish I understood Japanese to know what the gentlemen are saying in the video, but it was a treat to see the colt. Is he a full brother to Orfevre? Japanese must be a very strange language for Westerners. But I wonder if there were two Japanese words that could be easy to catch in the early part of that video. I wouldn't try to translate their conversation this time. But, yes, he is a full brother to Orfevre. The colt does look a lot like Orfevre, but he seems to have a little more bling on him, lol. Ridan_Remembered wrote: The colt does look a lot like Orfevre, but he seems to have a little more bling on him, lol. That's probably the way Shigeyuki Okada was very impressed by the colt. As much as I love Orfevre as a racehorse, he does have a big ol' head on him. Between the two brothers, I have to say Oriental Art is prettier. Here are another full-siblings that could be famous..
On Fire(JPN): 2003 bay horse, standing at Yushun Stallion Station. You can definitely see the resemblance between those three brothers, but there are some differences in their conformation. Of the three, I like Deep Impact's conformation the best. Jaspion Silent(BRZ), 2010C. Silent Name(JPN) x Xiririca da Serra(BRZ) by Know Heights(IRE), has been sold to a US-based owner and is expected to race in the states this year. Jaspion Silent is a two-time G1 runner-up in Brazil. -- replay of 2013 GP Derby Paulista (G1) <--- very thrilling finish!! I hope that he will become a G1 winner in the US!! I hope so too, and also hope he goes on to a very good stud career here in the U.S. I long for a top stallion from Sunday's line to stand here. what a nice video, thanks for sharing! It is such a lovely video. I have the same reaction as over on the foals thread. This was so soothing to see after coming home from work. I watched it on my phone at lunchtime, but nothing beats seeing it on a large screen. Nothing except actually being there, lol.